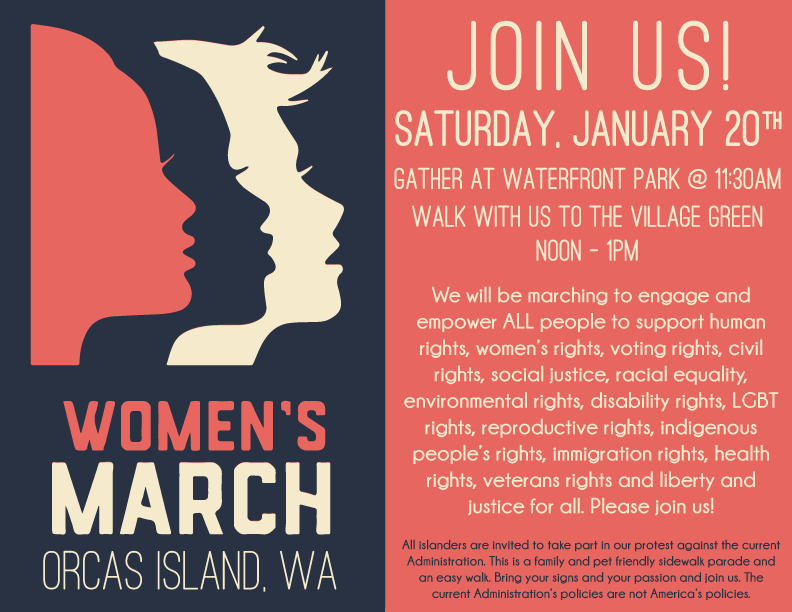 Gather at Waterfront Park @ 11:30am and walk with us to the Village Green from noon to 1pm. We will be marching to engage and empower ALL people to support human rights, women’s rights, voting rights, civil rights, social justice, racial equality, environmental rights, disability rights, LGBT rights, reproductive rights, indigenous people’s rights, immigration rights, health rights, veterans rights and liberty and justice for all. Please join us! All islanders are invited to take part in our protest against the current Administration. This is a family and pet friendly sidewalk parade and an easy walk. Bring your signs and your passion and join us. The current Administration’s policies are not America’s policies. Click Here for a printable 8.5" x 11" flyer. Click Here for a printable page of four flyers.